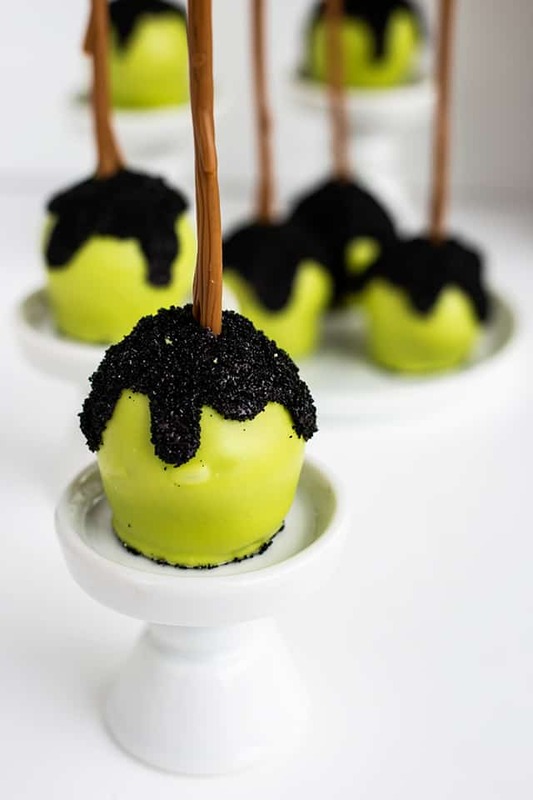 These poison apple cake pops are all glammed up with their sparkly black sanding sugar tops! The cake inside is a cake mix that has been doctored up with all the apple flavor you could possibly need! 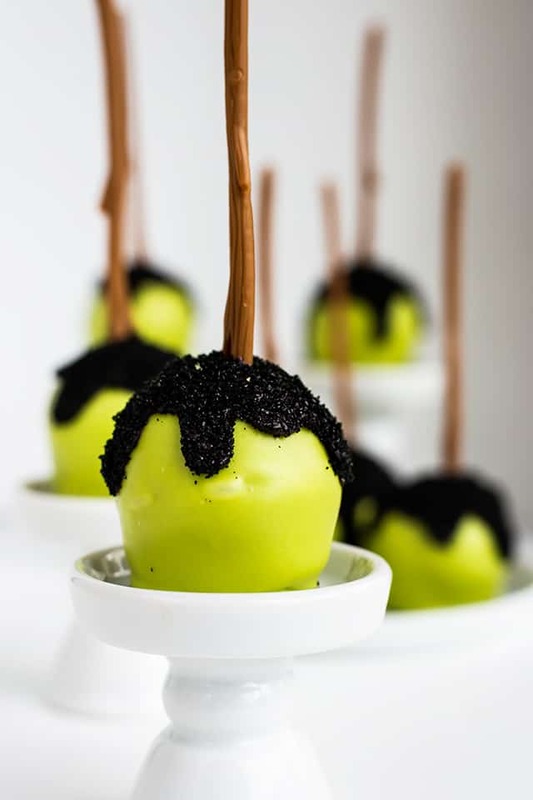 They’re the perfect Halloween sweet treat, especially for apple lovers. I’m so sad Halloween is almost here. How did this happen? I hope you don’t mind that I post a couple more recipes after these poison apple cake pops. I still have a kind of gross, but still, pretty darn awesome bloody red velvet rice krispies treat and the other is a jello shot recipe for those party goers to get up. If you don’t want to make a homemade apple cake, this apple cake with cake mix comes in handy. Though, I do have a pretty amazing apple cake recipe in this Apple Cake with Peanut Butter Frosting post. 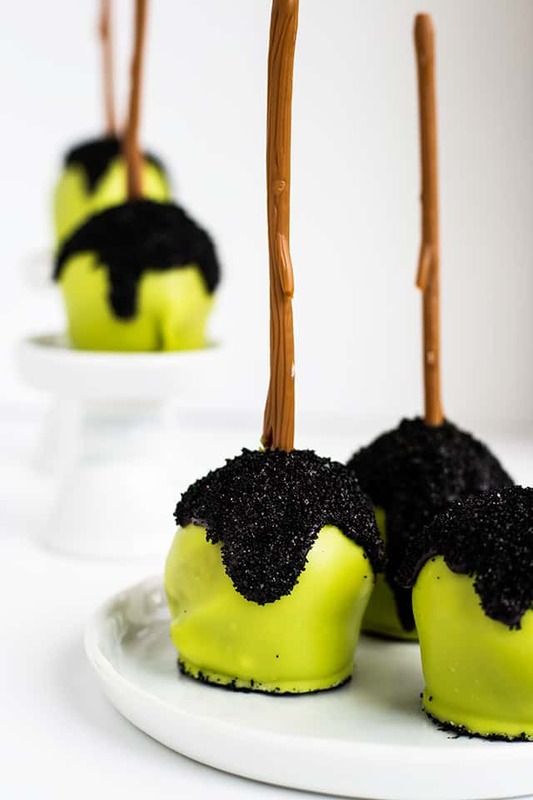 Use either one because either way, these poison apple cake pops are going to be a hit. I would start by first peeling the apple and then finely grating it. Mine looked almost like applesauce. You can use a larger grater instead if that’s all you have. Next, grab a large mixing bowl and add the yellow cake mix, substitute the water out for apple juice, oil, eggs, and the grated apple. Mix it up and pour into a greased 9×13 baking pan. Bake for 30 minutes or until done. You’ll notice the top isn’t as rounded as a normal cake mix that’s been baked. That’s completely okay. After the cake has cooled completely, I added in apple butter and frosting to bind the cake together. After that’s all incorporated and you have a giant cake ball in your bowl, grab a cookie scoop and start scooping cake pops. I used a 2 tablespoon cookie scoop and sat the cake pops on a piece of wax paper. After all the apple cake pops were scooped, I rolled them in a perfect ball. I taper the bottom by applying a little more pressure on the lower half of the cake pop. Then I press the bottom of the cake pop down on the wax paper so it has a flat bottom but don’t press hard enough that you lose the tapered look. Next, grab your cake pop sticks. I tried to link to the ones I used, but I can’t find them. I bought them at Walmart last year. You’ll also need vibrant green candy melts, green candy melts and black candy melts. Melt the green candy melts together. I’ll give you the amount for each down in the recipe box. You’ll need to add refined coconut oil to thin it out. I try to make sure the candy melts are completely melted and then add the coconut oil. It stays thinned out better that way. 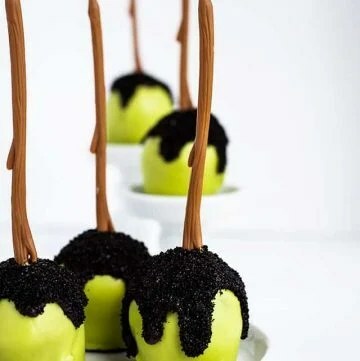 Dip the sticks in the candy melts and stick them in the center of each apple cake pop. Let the candy melt seal harden before dipping the entire cake pop in. Make sure the candy melts are very warm. Tilt the bowl to help coat the cake pops. Don’t pull straight up out of the candy melts. Pull up at an angle. This will help prevent the seal from pulling away from the stick. If you’ve had issues with the cake pop breaking before, try making the apple cake pops smaller. They can be tricky when they’re large. Dip the cake pops in the green candy melts. Place them on a clean piece of wax paper to dry completely. After they’re dried, melt the black candy melts and add a little coconut oil. The black will need to be thicker so it stays in place once it’s piped on the cake pop. Place it in a sandwich bag and cut the corner out. 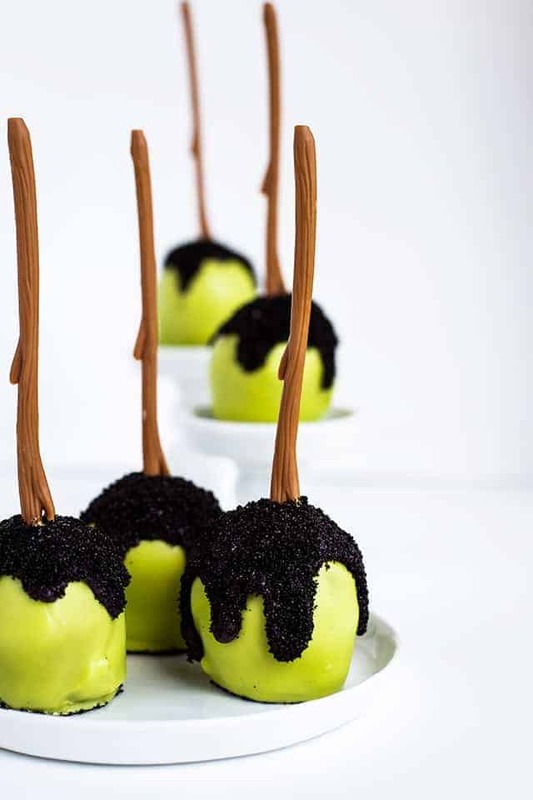 Pipe the black on the tops of the apple cake pops and add small drips. Have the black sanding sugar in a shallow dish and coat the black candy melts with sanding sugar so it sparkles. Let it dry completely and use a small brush to brush away any sugar that is on the green. Preheat oven to 350°F. Grease a 9x13 baking pan with nonstick cooking spray. Peel the apple and finely grate it. Be careful not to grate the core. Set aside. In a large mixing bowl, add in the cake mix, apple juice, oil, eggs, and grated apple. Mix until combined. Pour the batter into the prepared pan and bake for 29 - 31 minutes or until done. Insert a toothpick into the center of the cake and if it comes out clean or with moist crumbs, it's done. Crumble the cake into a large bowl. Add in the vanilla frosting and apple butter. Stir with a spatula or with a hand mixer until a big cake pop ball forms. Scoop the cake pops out with a 1 1/2 or 2 tablespoon cookie scoop and place on a piece of wax paper. I used a 2 tablespoon scoop. Roll the cake pops into balls. Shape them into apples by applying pressure towards the bottom of the ball so it's smaller. Flatten the bottom by pressing it onto the wax paper. Melt the vibrant green and green candy melts in a microwave-safe bowl. Microwave in 30-second increments and stir after each increment. Repeat until the candy melts are completely melted. Add in 4 1/2 teaspoons of coconut oil and stir until combined. Dip the cake pop sticks into the candy melts and insert into the center of the cake pops. Let the candy melt harden completely. Dip the cake pops into the candy melts and place onto wax paper. Add the black candy melts in a microwave-safe bowl. Microwave in 30-second increments and stir after each increment until it's completely melted. Stir in 1 1/2 teaspoons of coconut oil. Pour the black candy melts into a sandwich bag. Cut a small hole in one of the corners. Cover the top of the cake pop with the black candy melts and make some drizzles. Put the black sanding sugar in a shallow bowl. Sprinkle the sanding sugar on the black candy melts. Work quickly so the candy melts don't harden before the sugar is added.